Fishburn Park moved up to sixth in the North Riding Football League Premier Division table after a 5-1 win over Kader. 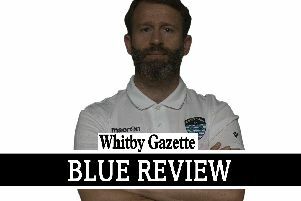 Carl Williams netted the visitors’ solitary strike, but goals from Sam Richardson, Adam Warrilow, Nathan Storr and a Callum Halley double saw the Whitby side home. Halley was Park’s star man. Staithes Athletic’s game at home to New Marske was off due to a waterlogged pitch. Whitby Fishermens Society lost 5-4 in the North Riding Challenge Cup last 16 against York League side Helperby United. James Armstrong hit two for the Fishermen, with Jake Faichney and Karl Storr also on the scoresheet in a poor performance by the hosts. Beckett League first division side Sleights also exited the competition as they lost at Unicorn of the Wensleydale League. Sleights started well, Theo Clarke scoring with a superb header to put his side ahead, however the home side equalised and took the lead before the interval and added a third goal in the second half. Man of the match was Clarke. Beckett League first division leaders Lealholm maintained their 100% league record so far with a 5-2 home win against Kirkdale United. The visitors started well and forced Lealholm keeper Tobi Fergus into a great early save. The opening goal arrived in the 34th minute when Mark McCarthy squared the ball to Brad Lewis, who scored with an unstoppable 25-yard strike. The Lealholm lead was doubled when a Dylan Swales pass out to Will Stuart-Cross was deflected into his own goal by a visiting defender. On the stroke of half-time Lealholm scored a third goal when McCarthy set-up Arron Leeman to score with an 18-yard effort to give the home side a 3-0 interval lead. Lealholm’s fourth goal arrived in the 72nd minute when Leeman sent Sam Russell clear to beat the offside trap and score. Three minutes later a Soni Fergus corner found Lewis, who headed in Lealholm’s fifth. Kirkdale finished the game as they started, scoring a brace of penalties in the last 15 minutes through Glen Forrester, but this breakthrough came too late for them. Man of the match went to Dylan Swales, who started at left-back but finished at right-back, while the Tigers also had their midfield trio of Soni Fergus, Lewis, and McCarthy in superb form. Goldsborough United stayed in the Scarborough & District Saturday League Division Two promotion hunt after a 4-1 win at Newlands Reserves. Dave Welham scored United’s first with Ben Watson supplying him for the only goal of the first half. Lee Brennan scored after the break for 2-0, before Mike Brennan’s goal made it 3-0. A bad mistake by United keeper Luke Hansell helped Newlands reduce their deficit, the Goldsborough gloveman passing the ball straight to Newlands striker Dan Hitchcock, who lobbed him to make it 3-1. United weren’t to be denied the win and Lee Brennan’s second sealed the win. Kieron Davies was United’s star man after a fine performance. Fishburn Park Reserves were without a game but return to action at Cayton Athletic this weekend. Fylingdales have finished their Scarborough & District Sunday League schedule for 2018.